This was the first game I've collaborated on remotely, and since it was a team of two we were able to manage communicating pretty easily. I'm not sure how it would have gone if the team were bigger. More "project management" might have been nice, like hourly updates that let people know how far we've gotten and when were planning to take a break. For a last-minute project, though, I'm pretty happy with it. 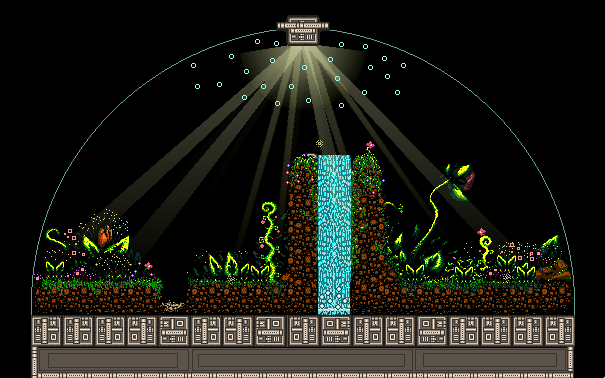 The game takes place entirely inside of a small terrarium. It's not clear whether it's the size of a snow globe or a zoo, but it didn't really matter. Players traverse the plants to catch fireflies that emit musical notes. To let the player walk over leaves and make it feel right, I made a drop-through platform that was invisible, and placed copies of it all over the level. The platform itself s just a trigger - it didn't have any physics that would collide with things - but when the player hits it from the top, it continually resets the player's Y coordinate to be above the platform. It felt horrible to write code like that, but it got the job done and allowed players to "ascend" plants by walking into platforms from the side as well. Aside from logic programming, I got to play around with lighting and particle effects for this project. Working with alpha layers is a lot of fun, and getting them to flicker and fade is really cool. Plants give off spores, fireflies have glow effects that brighten as the game progresses, and the player sheds little pollen particles once they come in contact with blooming flowers. The life we breathed into this tiny landscape was truly a joint effort - Britt's amazing art and sound made it something gorgeous to behold, and my programming gave motion to the various critters that live there. Check out the project page over here.